Each week we’ve picked the hitting and pitching prospects from each level (AAA, AA, A+, A, Short Season-A and Rookie league) who, in our opinion, had the best week. We’re always on the lookout for candidates, so tweet us (@Prospects1500, @PaulTheMartin and @Scotty_Ballgame) when you see a great performance. Martin picks his POTW hitters and pitchers for each level, while Greene presents other names at each level that are just as deserving of POTW honors. Enjoy, and make sure you’re keeping an eye out for these prospects in your dynasty leagues – even through the upcoming offseason! Peter Alonso is tearing the cover off the baseball since it the announcement that he would remain in AAA for the remainder of 2018. His triple-slash is .500/526/1.056 during that span, and this week he added 5 more doubles and 3 more home runs to his staggering season totals. Alonso is finding his name within this article at least once a month over the course of the summer. He truly is a talent that I cannot wait to see at the big league level. Unfortunately, for us fans, it will have to wait for 2019. Turnbull makes our list this week after his first two career outings in AAA. He faced the same team, Columbus Clippers, twice in one week and improved from start-to-start. His first attempt went well, going 6.1 innings with 11 strikeouts, 3 runs, and a tough-luck loss. The second start was extremely impressive where he allowed only 2 baserunners in 7 innings while striking out 8. Overall he struck out 19 Clippers last week en route to an impressive AAA debut for the 25-year-old prospect. Urena celebrated his birthday on September 1st by going 5/6 en route to his award this week. The powerful prospect hasn’t shown a ton of high-ceiling this year. However, he popped off for a solid performance to win #POTW during his birth-week. Urena needs to display a lot more power, average, or approach next year in AA/AAA or else his prospect status will falter quite heavily moving into his 25-year-old season. He also had a 9 RBI day in Hartford last Monday to start this week surging.
.@Mets‘ Jhoan Urena already had three homers and nine RBIs, but the @RumblePoniesBB slugger said he was trying for more. Garcia is gaining a ton of prospect hype right now. The latest buzz around him is the promotion to AA to use him in the playoffs with the Trenton Thunder. His first start in the new uniform was 5 innings, no-hits with 7 strikeouts. The Yankees prospect arm is lighting it up to the point where Jason Woodell is listing him 9th overall within their stacked system. This righty is one that you want high-up on your radar going into dynasty start-up drafts next season. He could bolt from AA to the bigs in a Severino-type way. He will be 20-years-old next season which is right around the time Severino was rumored to be moving faster than people expected. The same seems to be happening with this kid. #ProHogs | Trevor Stephan (@tstep23) throws a quality start, good for his 3rd Win with the Thunder. RHP Jordan Yamamoto finishes his regular season with a fantastic 1.83 ERA, 68.2 IP, 43 H and 85 K.
.@robert_dugger went at least 7 quality innings for a fifth straight time out tonight, 0.50 ERA, 39/8 K/BB over span. Chisholm is a toolsy prospect that showed almost every single one last week. The highlight of his season in 2018 is the power. 3 home runs this week adds to his season total of 25 which is 16 more than he had in 2017. “Jazz” was previously viewed as a speedy, twitch shortstop who could potentially develop into some decent power down the road. One year later he finds himself ending the season with 25 HR and 17 SB in 117 games. 2019 should be another year of growth for Jazz as he continues to plow forward into stardom. Jazz Chisholm went yard for the third straight night. Ramon Hernandez became the first Rawhide player to homer 20 times in a season since 2015. Cole Stapler tossed six shutout innings. It was difficult to choose between Rosso and Lowther for the award this week. Both have had seasons of extreme growth and each carry ERA nearing 2.00 to end the 2018 season. I might as well use this space to say exactly how good both of them have been this season. Rosso and Lowther both eclipsed >9 K/9, Lowther surpassing 150 K in 123.2 IP. This week was the perfect cap to each of their seasons in A+ and keep them firmly on the radar for next season’s upcoming dynasty drafts. Hicklen is doing the impossible. Somehow he was able to make the Lexington Legends even MORE exciting that they already were previously. Since joining A-ball, the outfielder is slashing .307/.378/.507 with 17 HR and 29 SB in 82 games. It is one of the most impressive stat lines in the minors, and it’s incredible that he’s achieved this in such a short amount of time. Hicklen will be an absolute steal in offseason dynasty drafts because most people still don’t know he exists within the same system as MJ Melendez, Seuly Matias, Khalil Lee, and the rest of their college arms from the 2018 draft. The 2017 draft pick was promoted to end the season in A-ball with the Charleston RiverDogs. He made the most of his two starts by striking out 17 batters in 12 innings and only allowing 2 runs in his 2 victories. Semple debuted with a 10:0 K:BB outing where he allowed only 2 hits in 6 innings. Much better than his debut this season which came aggressively in A+ with Tampa. Slowing down his progression allowed a full pitcher to emerge by the end of the season who left of an extreme high with these 2 outings. He is now tied for the South Atlantic League lead with 147 strikeouts (131 IP). Mets 4th rounder from 2017. Reynolds is more of a tank than a man. The 6’7″, 237 lbs lefty fired up for multiple extra-base hits to go along with 4 homers this week. Taken in round 4 of the 2016 draft, Reynolds has not produced much of anything outside of the home run category since joining the pros. However, there is no doubt that a body-type such as this is extremely exciting when visions of Aaron Judge and Giancarlo Stanton start to come to mind. Reynolds needs some more seasoning for sure, but 4 HR in a week, 17 HR on the season, with 31 XBH and 13 SB in 72 games keeps me intrigued.
.@sean___reynolds has a double and a triple with 4 RBI for the @BataviaMuckdogs today. The game is in the 3rd inning. Latz capped the year strongly over his last 10 starts. Only allowing more than 3 runs in 2 of those outings and nearing 9 K/9 are stats that Latz has not shown since being drafted last season. The sample is still incredibly small, but the lefty was showing signs of life to end the year. This week he generated swinging strikes on 1/5 of his pitches. Latz could go into next year in an interesting group of low-level Rangers’ arms led by Hans Crouse. Turang is not taking any time getting used to the professional level. These 4 games are a microcosm of his sample so far which includes a .299/.411/.375 triple-slash and 14 SB. The pure shortstop shows off his defense any chance he can, but the bat is really shining in his debut. This week he added 4 more steals to the total that will carry him into the high-ranks of dynasty league First-Year Player Drafts. 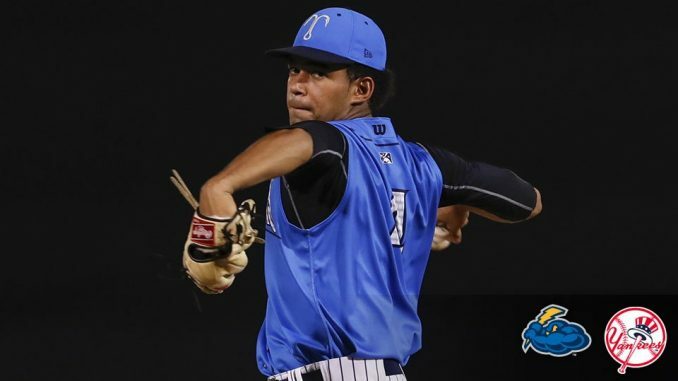 He is a tooled-up shortstop with power potential, great speed, and a solid glove that could breeze through the minor leagues with steady progression. Perez is spending his second season in rookie ball with the Toronto Blue Jays. Although the ERA is a bit off-putting, the strikeouts are there again this year. This start was interesting based on the 6% swinging strike rate that came along with no hits and 7 strikeouts. Usually, a low swinging strike rate like that comes with more hits, but what I would guess is that the command was on point to where he was getting a lot of called strikes. Either way, Perez was impressive in this start.